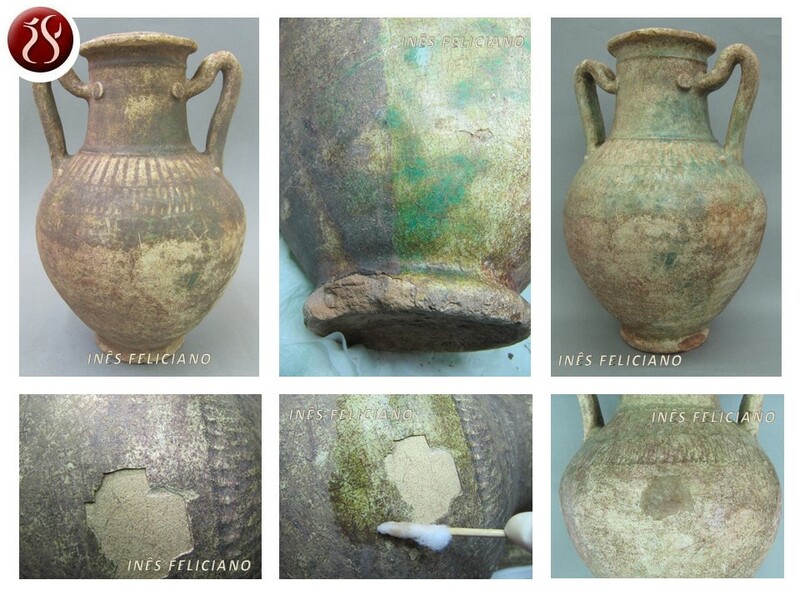 Intervention: Dirt and concretions removal; Surface cleaning; Consolidation; Glaze gap filling and levelling; Chromatic reintegration of fill; Protective Finish. Conservation status: Previous intervention presenting excessive and aged repainting, as well as inappropriate fillers, without complying with the original aesthetic program according to fragment later discovered, whose replacement in the object was not possible; Dirt impregnated throughout the surface. Intervention: Removal of excess fillers and repainting; Cleaning; Edge consolidation; Fill; Fill leveling; Chromatic reintegration allowing the identification of the new intervention; Protective finish. 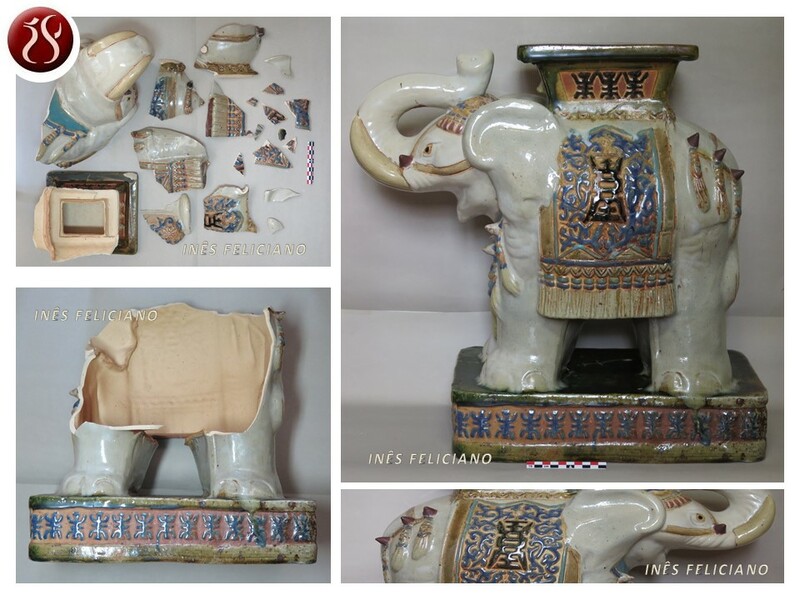 Conservation status: Previous intervention with poorly executed bonding with saliente glue and misplaced fragments; Ceramic elements united with two copper repair pins extremely oxidized; Several fractures; Absence of ceramic material; Impregnated dirt in the gaps edges and object surface. Intervention: Previous intervention elements removal; Cleaning; Bonding; Filling; Leveling fills; Chromatic reintegration; Protective Finish. 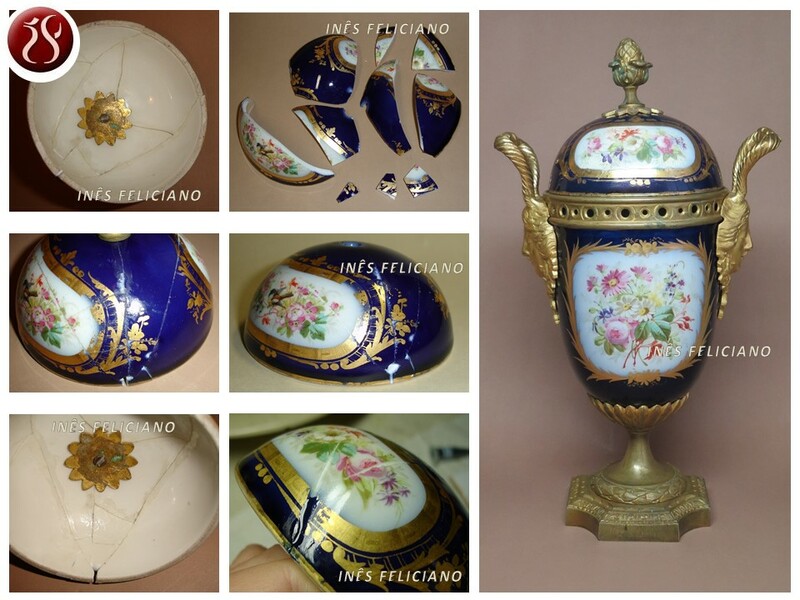 Conservation status: Numerous fractures; Edges abrasion, absence of ceramic paste and decorative elements; Dirt impregnated on surface and edges. Intervention: Cleaning; Consolidation; Bonding; Filling; Chromatic reintegration; Protective finish. Conservation status: Numerous fractures; Edges degradation and absence of ceramic paste; Impregnated dirt in the whole surface. 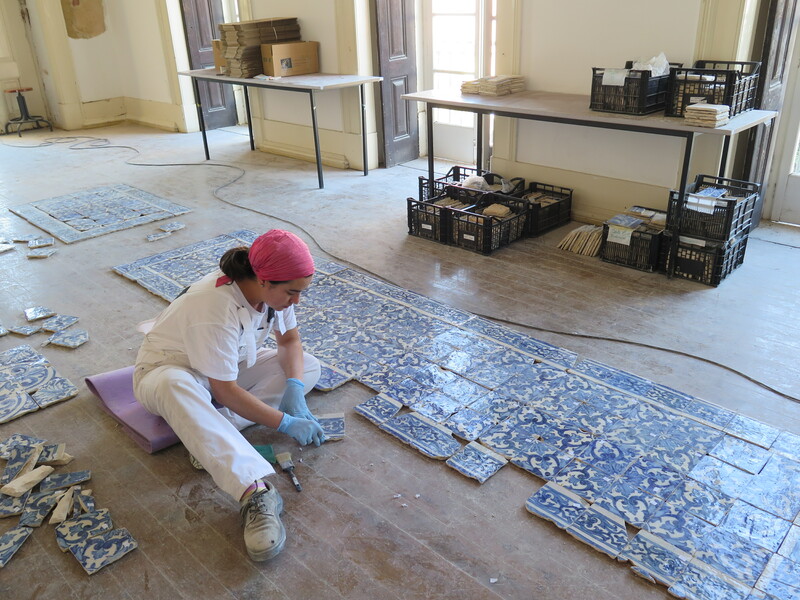 Intervenção: Cleaning; Consolidation; Bonding; Filling; Chromatic reintegration; Protective Finish. 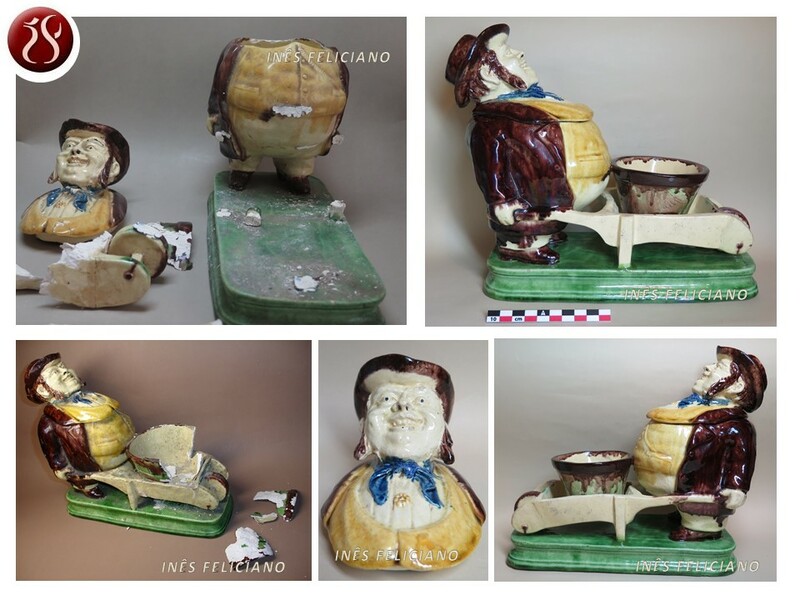 Conservation Status: Previous intervention with traces of aged glue and misplaced fragments; Numerous fractures of different sizes; Gaps with considerable lack of ceramic paste and gold decoration; Dirt impregnated in the edges and on the object surface. Intervention: Removal of previous bonding; Cleaning; Bonding; Filling with epoxy resin and inorganic pigments; Fillings levelling; Chromatic reintegration with airbrush and gold decoration retouch; Protective finish. 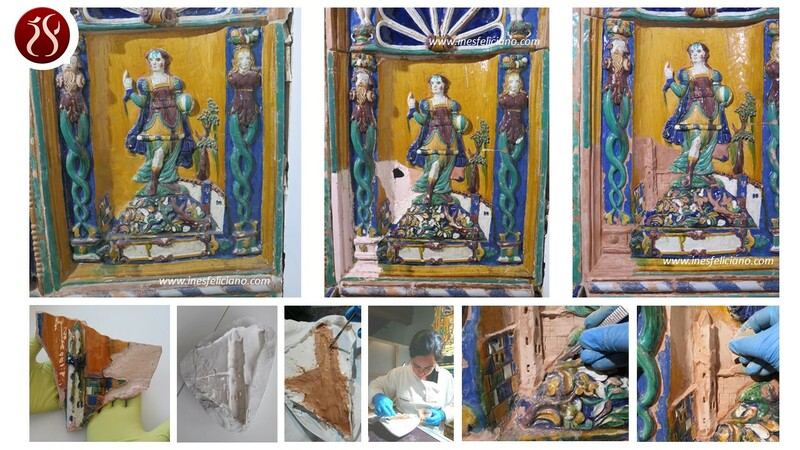 Conservation status: Previous intervention showing aged and poorly executed bonding with salient glue; Extensively painted surface with the objective of omitting the intervention performed; Edges degradation and absence of ceramic paste; Impregnated dirt in the whole surface. Intervention: Previous intervention removal; Cleaning; Consolidation; Bonding; Filling; Chromatic reintegration; Protective Finish. Conservation status: Numerous fractures; Edges abrasion; Absence of ceramic paste; Dirt impregnated on surface and edges.